We are located just southwest of Long Key Channel, you can be in the Atlantic Ocean in 5 minutes for fishing, lobstering, snorkeling and diving. We can refer you to local fishing, diving, or snorkeling charters. Please note that we do not allow Jet Skis at our location. The 1-bedroom (700 square feet) has a King size bed as well as a pull-out futon and accommodates 2 people. This villa has a spacious living & dining area and a full size kitchen. We know you will be very happy with the size and quality of our accommodations. We provide our guests with a comfortable outdoor area, which includes a gas grill, hammock, a tree top deck, and two bicycles for touring the island and fishing bridge. We also have an ocean kayak available for guest use free of charge! We have a swim ladder from our docks for snorkeling and swimming in the clear waters that surround our location. We think we offer the best value OPEN WATERFRONT accommodation in the beautiful Florida Keys! Please note that we have a 2 week minimum during January, February and March and that we rent from Saturday to Saturday year round. Please also note that we do not take reservations more than 1 year in advance. Regulatory Note: Sunset Villas is a commercial multifamily property that provides 24 hour on-site management. This property has operated as a lawfully established permitted hotel since 1960, and was formerly known as Harry's Fishing Lodge. We also operate with Planning Director, Marlene Conaway's approval under Section 130-79(j) and exemption 134-1(b) of the Monroe County Land Development Code. Sunset Villas on Conch Key, which was formerly known and operated as Harry's Fishing Lodge, is owned and operated by Capt. Bill and Katrina Wiatt. Bill and Katrina met at Virginia Tech in the '80s, lived in Texas during the '90s, then 'kicked the corporate life' and purchased this beautiful Conch Key property in 1998. Location, Location, Location! Bill had the vision within 5 minutes of walking on to this property ... and Sunset Villas was born soon after. Boaters, water lovers and fishermen alike keep coming back, year after year, to enjoy our piece of paradise on Conch Key - it is truly a Place for the Chosen View. 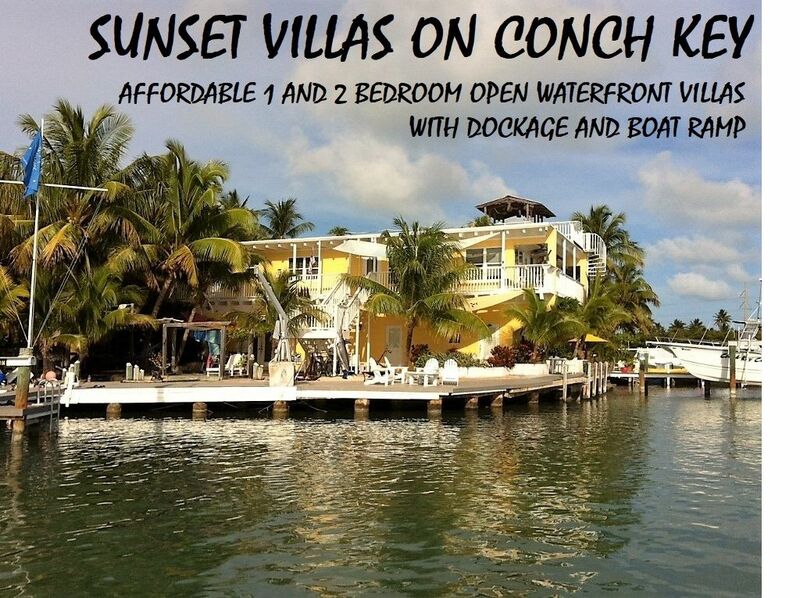 Sunset Villas on Conch Key offers some of the most fabulous OPEN WATER sunset views in the entire Florida Keys! We literally can see the sunset 365 days of the year ... each and every one is unique and special in its' own way. We also have boat dockage directly on the Gulf of Mexico with access to the Atlantic Ocean in less than 5 minutes via the Long Key Channel Bridge. Conch Key still has the feel of the 'old-time' Keys, so come and visit and see why we have over 85% return customers staying with us. Bathroom is equipped with double sinks. Property located directly on the open Gulf of Mexico with deep water dockage, swim ladders for swimming and spectacular open water sunsets. Central heating is available but rarely needed. We have an outside firepit; however, renters must provide their own wood. This villa is provided with two on site parking spaces. Spaces may be used for a vehicle and a boat trailers. Boat trailers are limited to those that trailer boats no longer than 25'. We provide wifi free of charge but service can be sporadic and therefore wifi is not guaranteed. Bath towels are provided but beach towels are not. Living room is provided with flatscreen cable TV and a futon. The kitchen has a full size refrigerator/freezer. The kitchen is equipped with full size stove oven combo. There are usually some pantry items salt, pepper, etc. left by previous renters. The 1-bedroom is provided with both inside and outside dining areas. Villa is provided with a private patio. In addition there are multiple decks and patios located on the property.